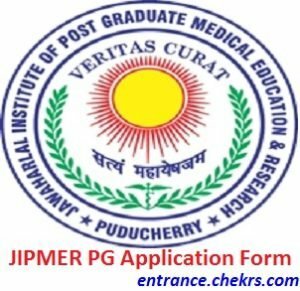 JIPMER PG Application Form (जेआईपीएमईआर पीजी आवेदन फार्म) 2017: Jawaharlal Institute of Postgraduate Medical Education and Research (JIPMER) has recently released the JIPMER PG Entrance Exam Notification 2017 at its official website. Candidates who are interested in getting the admissions in the PG (D.M/ M.Ch/ M.D/ M.S/ Fellowship) Courses that are offered by JIPMER are invited to register online for the JIPMER PG Application Form 2017 until the last date, i.e. 19th April 2017. The submission of online application Form for JIPMER PG entrance exam 2017 has already been started from 13th March 2017. 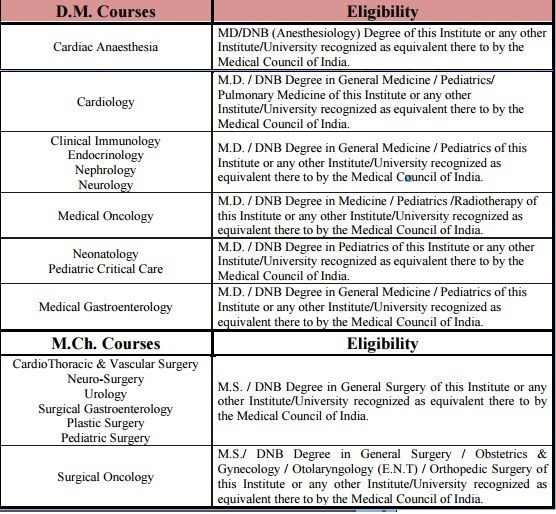 Only the candidates possessing MD/DNB or M.S./ DNB or M.Ch./DNB in the concerned discipline are invited to apply for the D.M / M.Ch / Fellowship Courses. Candidates must possess MBBS degree along with 12 months internship/ practical training until 30th June 2017 are eligible to apply for MD/ MS Courses offered by JIPMER. Candidates satisfying the eligibility norms in all the aspects are invited to register themselves by submitting the online application form for JIPMER DM/ MCh/ Fellowship courses 2017 between the dates 13th March to 19th April 2017. Candidates are advised to first go through the complete notification before start applying for the JIPMER MD/ MS Application Form 2017 to become familiar with the eligibility and terms that should keep in mind while applying for the JIPMER PG Entrance Exam 2017. Visit the JIPMER official website, i.e. jipmer.edu.in/. Click on the “Examination” link after following the “Education” section in the menu bar. Click on “PROSPECTUS JULY 2017 SESSION” and completely read it. Click on “Apply Online” link after satisfying the eligibility norms. Fill all the personal details and click on “Register” button at the end of the post. Fill all the other entries in the application. Pay the necessary application for the exam you are applying for. Take a print out of the completely filled application form for future uses. MD/ MS: Candidates must have completed their MBBS Degree with 12 months internship/ practical training that should be completed on or 30th June 2017. 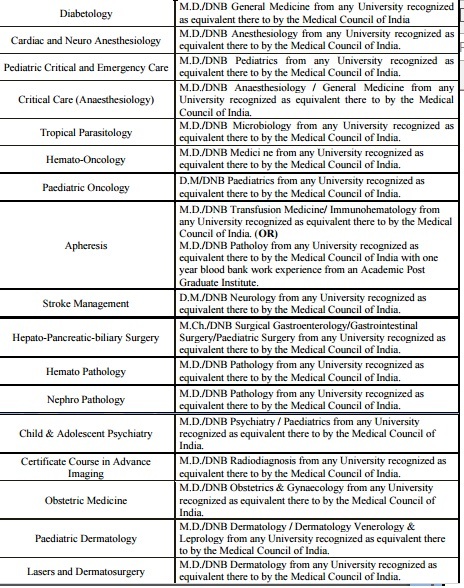 D.M / M.Ch / Fellowship: Candidates should have completed MD/DNB or M.S/DNB or M.Ch/DNB in the relevant medical field. The application fees will be accepted only in the online mode (Net Banking/ Credit Card/ Debit Card) of application payment. These below given below application fees are excluding the transaction charges. Its a great news for all those candidates who are looking for the commencement of the submission of online applications for JIPMER PG Entrance Exam 2017. 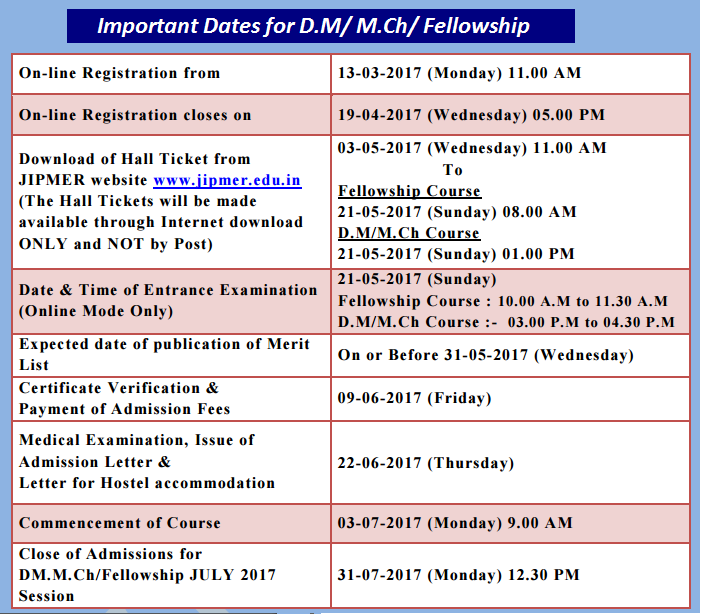 We are here to inform the candidates that the submission of JIPMER DM/ MCh/ Fellowship Application Form 2017 has been started from 13th March 2017. The Jawaharlal Institute of Postgraduate Medical Education and Research has invited the candidates satisfying the eligibility criteria in all the aspects to apply online for the JIPMER PG Application Form 2017 on or before the last date, i.e. 19th April 2017. Applications received after the last date will not be accepted. 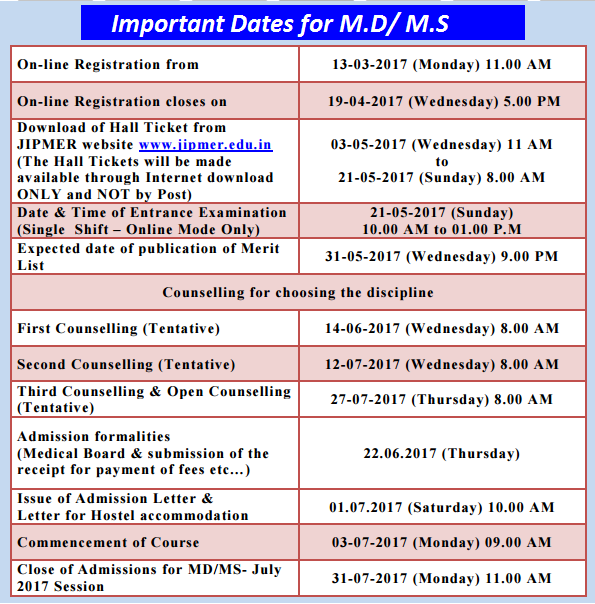 Candidates who have applied until the last date will be invited to appear in the entrance exam, that will be conducted on 21st May 2017. If any of the candidates is facing any type of troubles while applying online for the JIPMER MD/ MS Application Form 2017, then they are invited to contact us for their help by commenting at the end of the post.